Dependiendo del subtipo, la discapacidad intelectual puede o no ser un factor. A continuación se describen las características neurológicas comunes de MPS por subtipo. A modo de ejemplo, las tablas a continuación describen los programas sugeridos para la evaluación neurológica general y específicamente espinal de los pacientes con Morquio A (MPS IVA), un subtipo MPS con anomalías espinales predominantes. A continuación se describen los hallazgos cerebrales y espinales comunes de MRI de acuerdo con el subtipo MPS. Cabe destacar que una característica MRI singular descripta en pacientes con enfermedades MPS con progresión neurológica primaria es la apariencia ‘‘panal de abejas” de los ganglios basales y el tálamo.4 En varios informes de casos de enfermedades MPS se han descripto otras características de MRI, aunque éstas se observan con una frecuencia mucho menor. Tanto las evaluaciones específicas de la enfermedad como los exámenes físicos e intervenciones generales de salud deben seguir los lineamientos recomendados, que pueden variar según el subtipo de MPS. References: 1. McGill JJ, Inwood AC, Coman DJ, et al. Enzyme replacement therapy for mucopolysaccharidosis VI from 8 weeks of age—a sibling control study. Clin Genet. 2010;77(5):492-498. doi:10.1111/j.1399-0004.2009.01324.x. 2. Furujo M, Kubo T, Kosuga M, Okuyama T. Enzyme replacement therapy attenuates disease progression in two Japanese siblings with mucopolysaccharidosis type VI. Mol Genet Metab. 2011;104(4):597-602. doi:10.1016/j.ymgme.2011.08.029. 3. Clarke LA. Pathogenesis of skeletal and connective tissue involvement in the mucopolysaccharidosis: glycosaminoglycan storage is merely the instigator. Rheumatology (Oxford). 2011;50(suppl 5):v13-18. 4. Lehman TJA, Miller N, Norquist B, Underhill L, Keutzer J. Diagnosis of the mucopolysaccharidosis. Rheumatology. 2011;50(suppl 5):v41-v48. 5. Morishita K, Petty RE. Musculoskeletal manifestations of mucopolysaccharidosis. Rheumatology. 2011;50(suppl 5):v19-v25. doi:10.1093/rheumatology/ker397. 6. Muenzer J, Beck M, Eng CM, et al. Long-term, open-labeled extension study of idursulfase in the treatment of Hunter syndrome. Genet Med. 2011;13(2):95-101. doi:10.1097/GIM.0b013e3181fea459. 7. Hendriksz C. Improved diagnostic procedures in attenuated mucopolysaccharidosis. Br J Hosp Med. 2011;72(2):91-95. 8. Muenzer J. Early initiation of enzyme replacement therapy for the mucopolysaccharidosis. Mol Genet Metab. 2014;111(2):63-72. doi:10.1016/j.ymgme.2013.11.015. 9. Hendriksz CJ, Berger KI, Giugliani R, et al. International guidelines for the management and treatment of Morquio A syndrome. Am J Med Genet Part A. 2014;9999A:1-15. doi:10.1002/ajmg.a.36833. 10. Bagewadi S, Roberts J, Mercer J, Jones S, Stephenson J, Wraith JE. Home treatment with Elaprase® and Naglazyme® is safe in patients with mucopolysaccharidosis types II and VI, respectively. J Inherit Metab Dis. 2008;31(6):733-737. doi:10.1007/s10545-008-0980-0. 11. BioMarin Pharmaceutical Inc. VIMIZIM Web site. http://www.vimizim.com/. Accessed December 21, 2015. 12. BioMarin Pharmaceutical Inc. Naglazyme Web site. http://www.naglazyme.com/. Accessed December 21, 2015. 13. Muenzer J, Wraith JE, Clarke LA, International Consensus Panel on the Management and Treatment of Mucopolysaccharidosis I. Mucopolysaccharidosis I: management and treatment guidelines. Pediatrics. 2009;123(1):19-29. doi:10.1542/peds.2008-0416. References: 1. Agency for Healthcare Research and Quality. Defining the PCMH. https://pcmh.ahrq.gov/page/defining-pcmh. Accessed December 15, 2015. 2. Muenzer J. 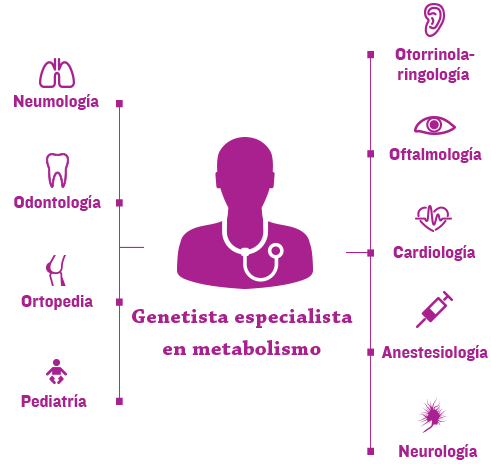 The mucopolysaccharidosis: a heterogeneous group of disorders with variable pediatric presentations. J Pediatr. 2004;144(suppl 5):S27-S34. 3. Hendriksz CJ, Berger KI, Giugliani R, et al. International guidelines for the management and treatment of Morquio A syndrome. Am J Med Genet Part A. 2014;9999A:1-15. doi:10.1002/ajmg.a.36833. 4. Zafeiriou DI, Batzios SP. Brain and spinal MR imaging findings in mucopolysaccharidosis: a review. AJNR Am J Neuroradiol. 2013;34(1):5-13. doi:10.3174/ajnr.A2832. 5. Solanki GA, Martin KW, Theroux MC, et al. Spinal involvement in mucopolysaccharidosis IVA (Morquio-Brailsford or Morquio A syndrome): presentation, diagnosis and management. J Inherit Metab Dis. 2013;36(2):339-355. doi:10.1007/s10545-013-9586-2. 6. Kakkis ED, Neufeld EF. The mucopolysaccharidosis. In: Berg BO, ed. Principles of Child Neurology. New York, NY: McGraw-Hill; 1996:1141-1166. 7. Muenzer J, Wraith JE, Clarke LA, International Consensus Panel on the Management and Treatment of Mucopolysaccharidosis I. Mucopolysaccharidosis I: management and treatment guidelines. Pediatrics. 2009;123(1):19-29. doi:10.1542/peds.2008-0416. 8. Lachman R, Martin KW, Castro S, Basto MA, Adams A, Teles EL. Radiologic and neuroradiologic findings in the mucopolysaccharidosis. J Pediatr Rehabil Med. 2010;3(2):109-118. doi:10.3233/PRM-2010-0115. 9. Giugliani R, Harmatz P, Wraith JE. Management guidelines for mucopolysaccharidosis VI. Pediatrics. 2007;120:405-418. doi:10.1542/peds.2006-2184. 10. Scarpa M, Almassy Z, Beck M, et al. Mucopolysaccharidosis type II: European recommendations for the diagnosis and multidisciplinary management of a rare disease. Orphanet J Rare Dis. 2011;6:72. doi:10.1186/1750-1172-6-72. 11. Neufeld EF, Muenzer J. The mucopolysaccharidosis. In: Scriver CR, Beaudet AL, Sly WS, Valle D, eds. The Metabolic and Molecular Bases of Inherited Disease. Vol 3. 8th ed. New York: McGraw-Hill; 2002:2465-2494. 12. James A, Hendriksz CJ, Addison O. The oral health needs of children, adolescents and young adults affected by a mucopolysaccharide disorder. JIMD Rep. 2012;2:51-58. doi:10.1007/8904_2011_46. 13. Coutinho MF, Lacerda L, Alves S. Glycosaminoglycan storage disorders: a review. Biochem Res Int. 2012;2012:471325. doi:10.1155/2012/471325. References: 1. Solanki GA, Martin KW, Theroux MC, et al. Spinal involvement in mucopolysaccharidosis IVA (Morquio-Brailsford or Morquio A syndrome): presentation, diagnosis and management. J Inherit Metab Dis. 2013;36(2):339-355. doi:10.1007/s10545-013-9586-2. 2. Harmatz P, Mengel KE, Giugliani R, et al. The Morquio A clinical assessment program: baseline results illustrating progressive, multisystemic clinical impairments in Morquio A subjects. Mol Genet Metab. 2013;109(1):54-61. doi:10.1016/j.ymgme.2013.01.021. 3. Walker R, Belani KG, Braunlin EA, et al. Anaesthesia and airway management in mucopolysaccharidosis. J Inherit Metab Dis. 2013;36(2):211-219. doi:10.1007/s10545-012-9563-1. 4. Hendriksz CJ, Berger KI, Giugliani R, et al. International guidelines for the management and treatment of Morquio A syndrome. Am J Med Genet Part A. 2014;9999A:1-15. doi:10.1002/ajmg.a.36833. 5. Lavery C, Hendriksz C. Mortality in patients with Morquio syndrome A. J Inherit Metab Dis Rep. 2015;15:59-66. doi:10.1007/8904_2014_298. 6. Theroux MC, Nerker T, Ditro C, Mackenzie WG. Anesthetic care and perioperative complications of children with Morquio syndrome. Paediatr Anaesth. 2012;22(9):901-907. doi:10.1111/j.1460-9592.2012.03904.x. 7. Muenzer J. The mucopolysaccharidosis: a heterogeneous group of disorders with variable pediatric presentations. J Pediatr. 2004;144(suppl 5):S27-S34. 8. Scarpa M, Almassy Z, Beck M, et al. Mucopolysaccharidosis type II: European recommendations for the diagnosis and multidisciplinary management of a rare disease. Orphanet J Rare Dis. 2011;6:72. doi:10.1186/1750-1172-6-72. 9. Valayannopoulos V, Wijburg FA. Therapy for the mucopolysaccharidosis. Rheumatology (Oxford). 2011;50 Suppl 5:v49-59. doi:10.1093/rheumatology/ker396. 10. Spinello CM, Novello LM, Pitino S, et al. Anesthetic management in mucopolysaccharidosis. ISRN Anesthesiol. 2013;2013:1-10. doi:10.1155/2013/791983. 11. Vitale MG, Skaggs DL, Pace GI, et al. Delphi Consensus Report: Best practices in intraoperative neuromonitoring in spine deformity surgery: development of an intraoperative checklist to optimize response. Spine Deformity. 2014;2(5):333-339. doi:10.1016/j.jspd.2014.05.003. 12. Solanki GA, Alden TD, Burton BK, et al. A multinational, multidisciplinary consensus for the diagnosis and management of spinal cord compression among patients with mucopolysaccharidosis VI. Mol Genet Metab. 2012;107:15-24. doi:10.1016/j.ymgme.2012.07.018.